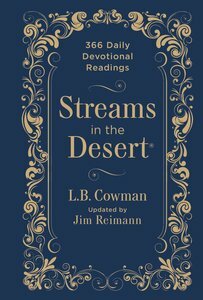 Since 1925, Streams in the Desert has sustained and replenished God's weary desert travelers. This updated edition promises to revive and refresh today's generation of believers. James Reimann, editor of the highly acclaimed and updated edition of My Utmost for His Highest by Oswald Chambers, again brings wisdom of the past in the language of today to this beloved classic. Capturing the timeless essence of the original devotional with fresh, contemporary wording and New International Version text, the timeless message flows unhindered. Lending guidance and hope while encouraging a deeper faith walk. The updated leathersoft package makes a ageless gift for both men and women any occasion. About "Streams in the Desert"